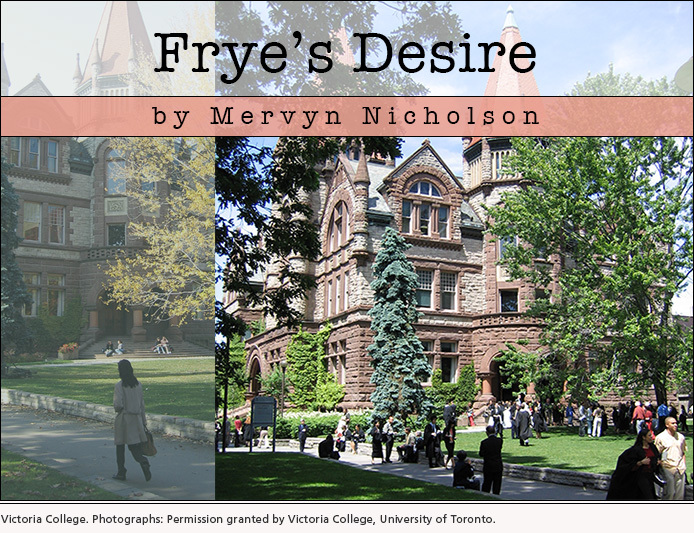 It has often occurred to me that Northrop Frye would be perfect for a detective novel—as the detective, of course. First, what a setting! quaint and historic Victoria College, in the quaint and historic University of Toronto, near the fabled Royal Ontario Museum and the imposing Ontario Legislature, with the Anglican church of the Redeemer on a neighbouring corner and the venerable St. Basil’s Roman Catholic church on another corner—not to mention the Park Plaza Hotel, where Sir Charles G. D. Roberts had held court—and shops and business towers at hand—and yet, still, lots of interesting old Victorian brick houses not too far away, and busy Yonge Street close, too. Great setting for a detective novel—lots of possibilities. Detective Frye would be not only brilliant, like Sherlock Holmes, and as observant and principled as Holmes—he would be witty and heroic, like Philip Marlowe, heroic in an understated way (as Marlowe is)—and witty as Frye himself was in life. And didn’t Frye describe himself as an “undercover” agent for the United Church? He is made for the job! Look at all the potential murderers and victims. And not just deans and provosts, as in the usual English Department murder mysteries. Professor detective Frye would know everybody—prime ministers and billionaire philanthropists—foreign potentates, artists, intellectuals—and not just wealthy or famous people but generations of students (including the lowly undergraduates he preferred to teach) or the servers at Three Small Rooms, his favourite restaurant, a block or so away from the splendid Victorian edifice where he taught for so many decades. Great plotting opportunities here!